Let’s kick off Women’s History Month by celebrating women printmakers. I’m a big fan of contemporary printmaking and how artists push the boundaries of the medium, especially since my only credentials in printmaking are from high school art classes. When one looks at the history of printmaking, one sees an ebb and flow in its popularity. From the 15th to the 18th century, printmaking was a major art form, appreciated not only for the nuances of tone and form, but also because the fine lines made with the tools allowed artists to produced fantastically detail masterworks of the past. In the 19th century, Mary Cassatt (1844-1926) was a pioneer in printmaking when the field was dominated by men. The revival of printmaking had begun in the 1850s and is a strong fine art medium on its own every since. Woodcut is part of the oldest technique of printmaking, known as relief. The artist gouges out areas of the surface, leaving only the design to be printed elevated. Ink is spread over the raised sections of the block and transferred to paper by pressure. Other forms of relief printing are linoleum cut and wood engraving. 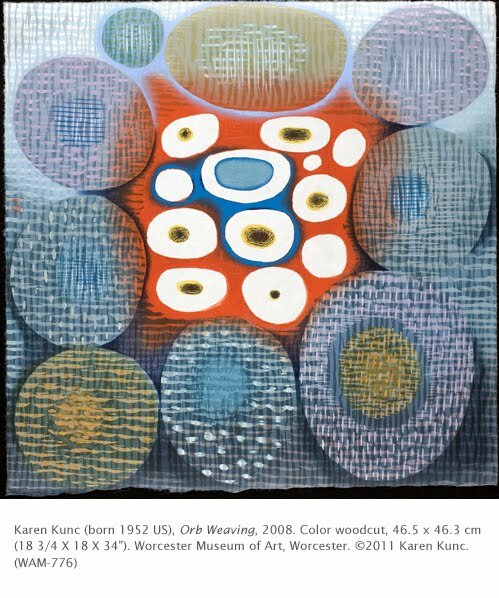 Karen Kunc follows a long line of successful women artists who work primarily in the field of printmaking. Starting in the early 20th century, women such as Mary Cassatt, Käthe Kollwitz, Mabel Dwight, Isabel Bishop, Kyra Markham, Adja Yunkers, and Kiki Smith have kept the art form a vibrant component of contemporary art in the 20th and 21st centuries. Kunc received her BFA from the University of Nebraska-Lincoln and her MFA from Ohio State University. She is a professor at the University of Nebraska-Lincoln. She is best known for her large-scale abstract woodcut prints, and has paralleled that with an exploration of dynamic printed three-dimensional book forms.